​It’s good for me to go outside my comfort zone and try new things: a zip line in northern Thailand, crossing a raging river in Slovakia or Ecuador, teetering on the edge of a cliff in Montenegro. 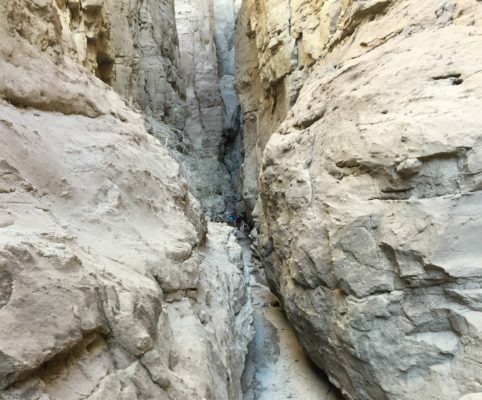 My adventure in a slot-canyon in Mecca Hills Painted Canyon was the most recent and definitely one of the scariest. I’m not a daredevil. Frankly, I’m kind of a wuss. But I don’t like that about myself and try to press the envelope, at least occasionally, and challenge myself to do something I’d really rather not do. So it was when Juliet and I chose to go to a remote location about forty miles from Palm Springs, California, and hike in a slot canyon. A slot canyon is a very narrow canyon that starts as a crack in the rock and, as a result of millions of years of rain, wind and erosion, is sculpted into a gorge considerably narrower than it is deep. I’d hiked in slot canyons in Death Valley and Zion, but this one was very different from them. 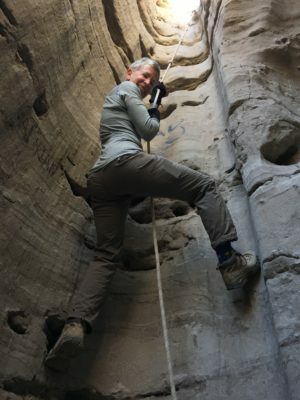 The one in Mecca Hills requires you to hoist yourself straight up several tall, smooth, rock faces using a rope tethered at the top and hanging free. There are occasional footholds, otherwise you’re walking up the slippery rock wall, pulling yourself up hand-over-hand as you go and then shimmying over the top on your belly, the rock crumbling beneath you as you move. Other spots involve contorting your body in ways you didn’t know possible so that you can squeeze through the smallest of spaces and come out dust-covered and bleeding on the other side. When I saw that first vertical rock face with its free-swinging rope, I was shocked. The hike description hadn’t said a thing about this. I thought “I can’t do this.” My right shoulder has no more cartilage and doesn’t function like it used to. I walked up and grabbed the rope and said aloud “I can’t do this.” Juliet, an adept and graceful athlete and also a rock-climber, reconnoitered the situation by trying it out herself. She came back down and spotted me, giving me encouragement. I managed to do it but felt shaken, vulnerable, and frankly, terrified. Immediately after, there were two spots with no ropes and what appeared to be impossible configurations of rock requiring strength and coordination I thought I no longer had. With Juliet’s optimism and reassurance, I got through these as well, wondering all the while why I had subjected myself to what felt like torture. Further along, there was one more place similar to the first and then we were done, at least with that slot. After exiting, we walked for what seemed like miles through rocky, barren terrain, unsure where to go due to a complete lack of signage and not encountering another person to ask for direction. We discussed turning back and retracing our steps if we didn’t reach a way soon that would lead us back to the trailhead. But the thought of having to redo the slot in reverse was so alarming to me that we kept plodding on against better judgment. Finally in desperation, Juliet climbed to a higher point to observe the situation. Relieved to see other people on the next ridge, we scrambled up the hill and caught up with them. Like us, they didn’t know where they were going, but we figured if we remained lost, at least we would have company. We found the slot we were looking for and descended through it by way of steep, vertical ladders which seemed easy after what we had already done. So how did I feel at the end of the day? Exhilarated! Grateful that I had made it. Thrilled at sharing this with Juliet without whose confidence I most certainly would not have attempted it. But when she said to me “this was so much fun, I could do it again tomorrow”, I told her she would be doing it alone! You are one brave soul! Adele! You are really something else! Lucky to have the Juliet to egg you on….what’s next for you two? OMG, you guys are amazing! I was freaking out about you running into a flash flood. Maybe if’s time for a river cruise in France?? You never cease to amaze me with your adventurous spirit and daredevil (dare I) approach. We are heading to Palm Springs in March and I’ve taken notes from your post but that may be as far as I get. I’d need to trade George in for a Juliet!